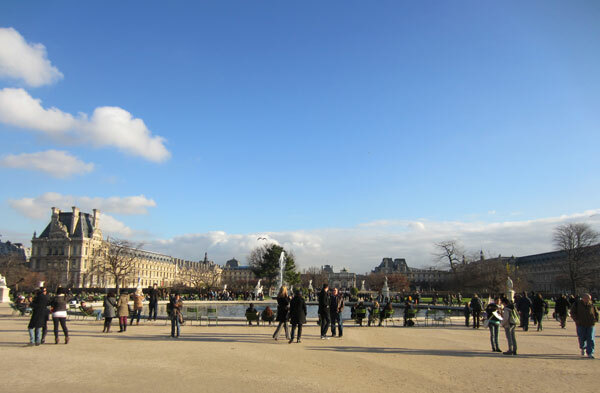 J’adore Paris! I really do. Not only do I love that I can get on a train in London and in just over 2 hours I am eating a buttery croissant in the heart of Paris, but I love the romantic notions behind the city, the boldness of its landmarks, the rambling laneways of hidden gems and of course what I love the most about Paris is the food and wine. And with every trip to Paris I discover new restaurants and wine bars which fuel this undying love. I had heard murmurings about Verjus Wine Bar, a new Paris hotspot luring crowds into its cosy cellar and serving up inspired small plates and a wine list to please. 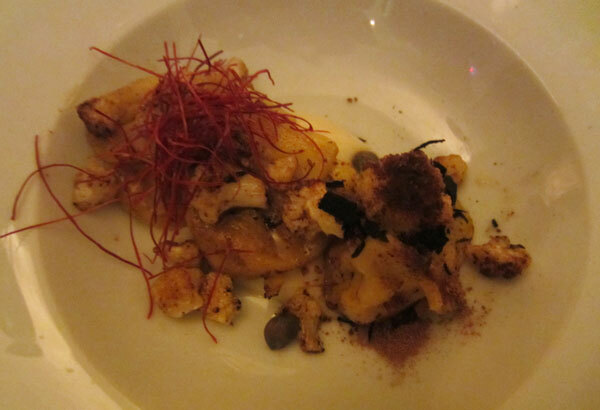 I was even more excited to discover that Verjus – the restaurant, opened just a week before I was going to be in Paris. Reservation made – result! That was until I received an email from owner Laura two days prior to my booking sadly notifying me that head chef Braden was in hospital and that they wouldn’t be able to open the restaurant over the weekend. Obviously concerned for the chef but also disappointed I wouldn’t be able to get the scoop on Verjus. 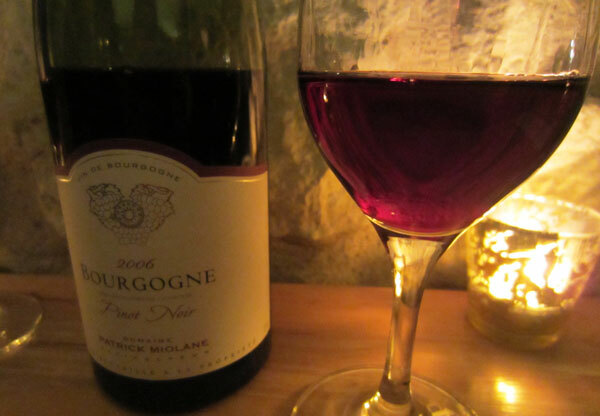 We headed instead to the Verjus wine bar and were treated to an assortment of dainty plates and robust wines. It is an intimate setting in an old stone archway, with just a small bar and some stools to perch yourself on. We arrived at 7:30pm and within half an hour it was standing room only. The menu consists of a selection of small plates all of which are rather sophisticated and sound delicious. 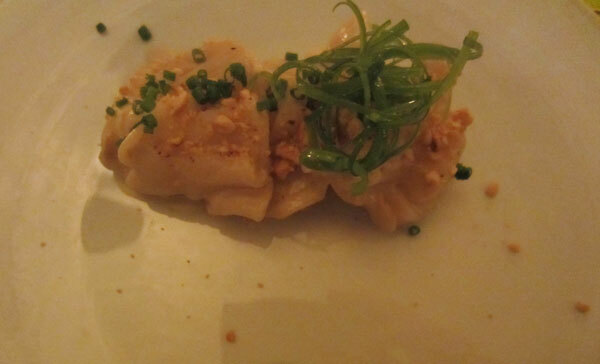 Just shy of ordering one of everything we started with the celeriac dumplings with dan-dan sauce. Tasty little dumplings they were, although the texture a little bland. Rich cheese filled ravioli with cauliflower, chillies and capers was spot on. With a dusting of cocoa to add a slight bitterness and the crunch of fine ash shards. 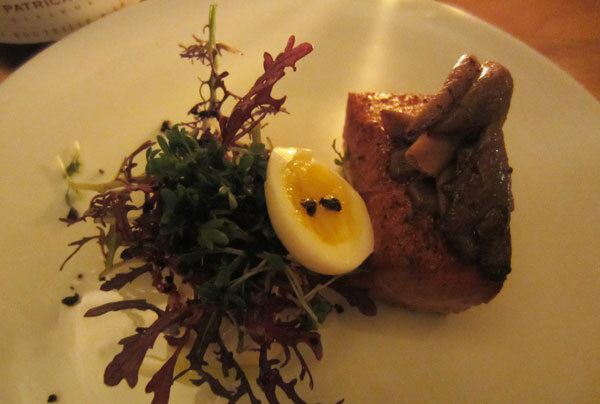 Perfectly cooked salmon with silky tofu, mustard rocket and a gooey quails egg made for a very tasty mouthful. Each dish is so well thought out in terms of flavour and texture, it is far beyond your average bar food and even menus of so many restaurants I have been to which are just doing small plates. 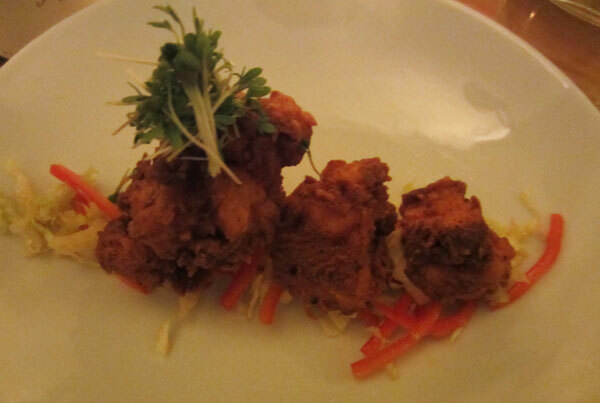 I had read about the fried chicken bites already becoming an institute for the young Verjus. And I can now see why. Crunchy, non-greasy, and succulent these morsels of buttermilk fried chicken are a must. And the cabbage slaw is the perfect accompaniment. 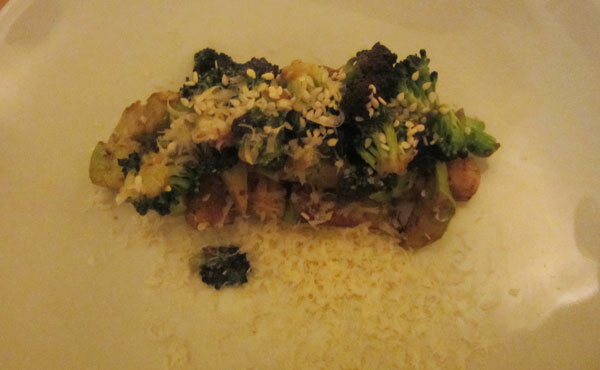 Charred broccoli with Korean rice cake was a stand out dish for me. The saltiness of the anchovy and parmesan was cut through by the lemon juice and balanced by the fresh broccoli. The crunchy rice cake gave great texture to the mouthful. Again a magically put together dish. When is France you cannot finish a meal without cheese. Actually I don’t need an excuse to eat cheese, especially in France. 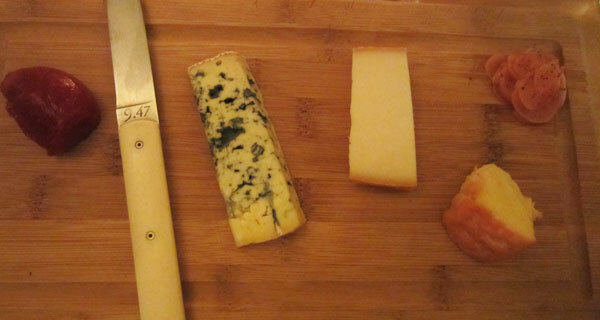 A blue, camembert and hard goats cheese were all delicious and vanished within seconds. I wasn’t so keen on the accompaniments of port jelly and ginger, I think they were too strong and masked the flavours of the cheese. Just cheese for me please. Dishes range from €4-€12. They are quite small, so if you are sharing it really is just a mouthful each. But with each dish on the menu being such a stand out I wouldn’t be afraid of ordering one of each. Having now been teased by the elegant offerings of Verjus wine bar I am even more eager to dine at the restaurant. Just another reason to be back on the train to Paris for another gluttonous weekend very soon.